"Don&apos;t glue your fingers together"
This glue works amazingly quick. Wish I got a slower curing and thicker glue as this bonds to anything in seconds. This glue will bond instantly to skin and I glued my fingers together, got it on my foot when gluing a metal weight to a nose cone, some on the top of the hand. While it cures on skin there is a slight burning sensation. Once on the skin it is somewhat of a pain to get off. My advice is to use this when gluing things into a hole or slot and make sure to have the parts ready to be glued together for if you are too slow it will cure and the parts won&apos;t be joined together. INSTA-CURE super thin glue dries within 1-3 sec. This product is a good glue, but to thin for me. I glued my fingers together more than I wanted to. This stuff works great. I will be purchasing more in the future. I cut a very small part of the tip off and used an Xacto knife to poke a hole. Even that tiny hole was enough to have this running everywhere. Works as advertised. Water thin, wicks into small cracks nicely. 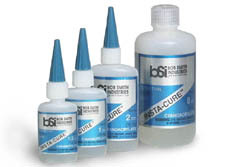 Use a lot of care when using these thin glues, they can make a real mess. Cyanoacrylates (CAs) have become the adhesive of choice for most hobby and household applications. High quality CAs such as INSTA-CURE, when used properly, form bonds that in many cases are stronger than the material that is being adhered. INSTA-CURE is a highly refined CA which, combined with its freshness, gives a guaranteed 2 year shelf life. CAs are reactive monomers that chemically link (polymerize) when pressed into a thin film. The very thin layer of water moisture present on most surfaces acts as an alkali, or weak base, which is the catalyst that results in bonding; however, the presence of detectable amounts of water usually degrades the performance of CAs.